Before beginning, I'd like to point out that "Home" was cool. There are many nice touches in the episode, and this shot was one of them. Archer is properly lit given the direction he's supposedly looking toward, and the stars are mostly correct (the only real 'problems' are relative brightness and the fact that at least one star that should've been visible is strangely absent). Archer looks toward north and points out that the star "just to the left of Polaris" is where they found their first Class M world, one which had psychotropic compounds in the air. This, of course, is the planet from "Strange New World"[ENT1], and we get a shot of the stars he's looking toward in the evening sky. 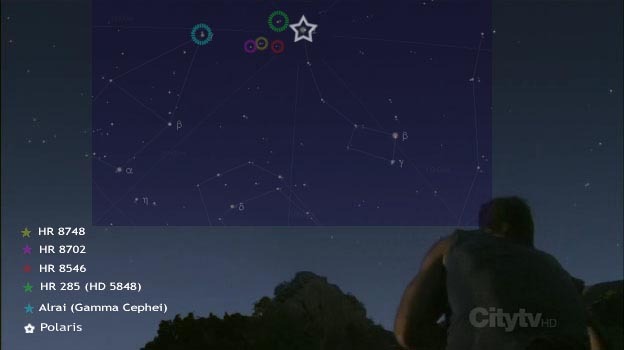 The above is an overlay of the stars visible on the screen and, from the program "Cartes du Ciel", stars above a certain visibility threshold. The match between sky chart and screenshot is not perfect with all the stars due to various factors, hence the occasional double-star or streak look. However, you can see that it's very close, and certainly close enough for what I'm doing. What am I doing? Well, I want to know which star Archer was talking about. I want to be able to place the "Strange New World" planet in context, and do some cartography. I. The star should be just to the left of Polaris, or as close as possible thereto. II. The star should not be too far from Earth. a. I'm ignoring the speed and time from "Broken Bow" which puts the Klingon homeworld at less than a light-year from Earth. b. I'm accepting the speeds from "Cease Fire"[ENT2] as a top-end which allows for the most distance with which we can work . . . the velocity indicated was 1460c. c. The approximate date for "SNW" was May 8, 2151, which puts Enterprise at four weeks and a day from home. d. Thus, the maximum distance for the star in question should be 130 light-years, and probably less. III. Preferably the star should match what we'd expect to allow it to have a planet with life in regards to age, metallicity, variability, and so on. Now, there are five stars circled above . . . only four of which are visible in the sky in the episode. For some reason, HR 8702 was not visible at all, though being as bright as HR 8748 it ought to have been quite visible. This is not a bad thing, though, since HR 8702 is helluva-far, and thus we wouldn't want that to be the SNW star anyway. As for which one is just to the left, I'd say either HR 285 or 8546 ought to be the star in question. While Alrai is due left, it is somewhat further . . . "just to the left" may not imply such precision. Alrai is the clear winner. At just 45-50 light-years away, the star is in a perfect spot to satisfy the requirements of distance. HR 285 is over three hundred light-years away according to the parallax. HR 8748 is around 1000 parsecs away, and 8546 is about 540 light-years distant, by their parallax. The star is large, bright, and hot, and is sufficiently old to have burned out all of its hydrogen. It has a known stellar companion, a smaller, dimmer red dwarf with an eccentric orbit taking it no closer than 10-12AU. Further, a planet twice the size of Jupiter has already been found in the system. The star's habitable zone would be at about 2.9 - 3.4AU. Alrai is not without problems, however. The subgiant primary star is acceptable, but a second star with a mass 40% of our sun seems like it might be destructive when it cruises in to Saturn's distance every 70 years and only pulls back as far as Uranus . . . for all the effect Jupiter, halfway to Saturn, has on the inner planets, it is only 1/1000th the mass of the sun . . . not almost half. But still, it will remain a fairly constant companion in the sky. The gravitational pull on a planet in the habitable zone would be akin to lunar levels at maximum (e.g. a couple of hundred to a few hundred times less than the sun), though variable due to the relative orbits. There's also the known gas giant that might cause problems. It has an eccentric orbit centered around the 1.8 to 2.3 AU range. Thus, it seems likely that the giant could interfere with an orbit (or formation) of a rocky, earth-like world at 3AU or thereabouts unless the planet was very, very lucky. However, the gas giant could also serve as 'big brother', deflecting or absorbing any smaller bodies in the system. We can certainly imagine a number of ways for a planet to exist in such a system (especially . . . perhaps even preferably . . . as a moon of the gas giant) . . . but the issue is that there are just as many ways for the planet to have never formed, or long since augered into the sun. It's worth noting that the good Mr. Joshua Bell reminded me of Celestia. I loaded up Celestia and looked north, and a few other stars were visible in the direction indicated. Some ought not have been visible in the sky when Archer looked, given the evening glow of the atmosphere . . . it's possible to calculate what could've been visible, but given that HR 8546 at magnitude 5.27 is readily visible in the shot at its height, that's a good indicator of what could possibly be seen at all. (That webpage, incidentally, seems to indicate that mag 6.1 (dimmer than 5.27) is as good as it gets for the naked eye looking at a 45 degree angle.) Just for caution, I ramped up Celestia's visibility to magnitude 7 (which means I was seeing some helluva-dim stars), and checked the distances to all of the stars within a 60 degree wedge to the left of Polaris, plus a few more at random. HD 22701, 133ly, dim (mag 5.84, or dimmer than 8546), but it's almost straight up from Polaris, and only a little bit leftward, and out of frame in the shot. It's also only barely within possible range. HD 223731, 128ly, very dim (mag 6.56), just upward from Alrai, and not visible in the shot, barely within possible range. HD 223778, 35ly, very dim (mag 6.36), up and to the left from Alrai, not visible in the shot. However, at a distance of just 35 light-years, I wish it were. However, it's even further from "just to the left" than Alrai, and too dim. HD 3440, 105ly, very dim (mag 6.38), not visible in the shot . . . to find it, one would start at Polaris and go on past HR 285. HD 2589, 128ly, very dim (mag 6.18), not visible in the shot . . . it's past HR 285 and up from Alrai. So, Alrai still seems the only logical possibility, even accounting for stars which Archer could not possibly have seen. It's worth noting that placed the "Strange New World" planet around the star 61 Ursae Majoris. What happened, obviously, was that the writer of the text above simply decided to take the planet from "Strange New World", assign to it the name of Archer IV (from "Yesterday's Enterprise"[TNG3]), and go from there. Unfortunately, however, he decided to throw in a needless reference to the star the planet orbits, and referred to Geoffrey Mandel's Star Trek Star Charts book to do so. However, 61 UMa cannot be the correct star, thanks to what we now know. We thus find ourselves with a contradiction within the canon. In the scene from "Home", 61 UMa would be off-screen and far to the right of Polaris. Just take a look at the image below from the Cartes du Ciel program, oriented in the same way as the shot from "Home". 61 UMa is labelled. Polaris is marked in blue, 61 UMa in red. The approximate edge of the "Home" shot is in green. As you can see, 61 UMa is not just to the left of Polaris. It is, in fact, about 66 degrees . . . over a third of the sky . . . to the right. Indeed, the reason the green line marking the edge of the "Home" shot is in a slanted orientation is due to the fisheye depth-of-field changes required in order to get Polaris and 61 UMa in the same shot! 1. Visual: The stars shown in "Home" contradict 61 Ursae Majoris, because 61 UMa is not visible in the shot at all. 2. Dialog: "Just to the left of Polaris", as stated in "Home", also contradicts 61 Ursae Majoris, because 61 UMa is not near Polaris in the sky. Even if the Earth's rotation allowed 61 UMa to be leftward, 61 Ursae Majoris still wouldn't be "just to the left of Polaris". There are two constellations, including the Big Dipper, in the way. Because of the dual contradiction, it is quite difficult to accept the data from the Defiant's screen. But fortunately, we don't have to. Though the Defiant screen is canon no matter whether it was based on the non-canon Star Charts mess or not, Sussman has explicitly stated that the Defiant screen is of a previously-unknown lesser-canon level, "soft canon". Thus if the info isn't to be considered "hard canon", we have ourselves a lovely and quite official escape route . . . the screen is still canon, but the "Home" references clearly outrank the bio screen from "In a Mirror, Darkly" per the producer and writer. On the other hand, we do have the slight possibility of an in-universe rationalization, which would help us avoid simply dismissing the information. The Defiant's screen mentioned Archer IV as the first M-Class planet charted by Archer, with no mention of visitation, landing, and so on. There isn't even a mention of Archer having been on Enterprise at the time. So, one might be able to suggest that Archer had remotely charted the planet at some point, either while on Enterprise or from Earth before he left. Of course, then we'd have the extraordinary coincidence of there being pollen which adversely affects humanoid life on both planets. On "Strange New World"[ENT1], the pollen contained the well-known hallucinogen tropolisine which, in a bit of hazy science, was a "psychotropic compound" whose "atoms" each contained a "stray neutron". This extra neutron didn't seem to be the norm for tropolisine, though. When "it" (presumably the hallucinogen, and not the neutron) started to break down in one's bloodstream, it released an "undetectable toxin". It's a stretch, but technically this is not a toxic pollen, so much as a cause of a toxin that appears in humanoids when a substance in the pollen breaks down. If one does not wish to engage in such a stretch, however, then we're left with simply ignoring the needless 61 UMa reference in "In a Mirror, Darkly, Part II". This sort of thing is why the non-canon is to be avoided. Attempts to mix it in often cause problems, especially when the non-canon one wishes to add is not well-researched. Thus Memory Alpha, which throws its support behind 61 UMa, now bears a clear absurdity on its pages, in violation of the canon. In the article for 61 Ursae Majoris at Memory Alpha, hidden away from the main Archer IV stuff, someone managed to correctly conclude that 61 UMa was probably wrong, but then made the claim that Eta Cassiopeiae . . . proposed in Star Charts as the location for Terra Nova . . . was somehow correct. Reviewing the picture below . . .
Cassiopeia is the jagged line of stars to the left of the "house" shaped constellation of Cepheus, of which the blue-marked Alrai is the tip-top of the roof. In other words, Cas is to the very left edge of the screen, left of the darker blue overlay. Eta Cas fails here, in my opinion. First, by the time your eyes scan all the way over to Eta Cas . . . about a sixth of the sky away . . . you've skipped numerous stars -- some bright and attention-getting like those of Cepheus (hence its being a constellation), others dim -- that are much closer to Polaris. Second, Eta Cas is not due left of Polaris . . . that honor befalls Epsilon Cassiopeia, the star on the top left of the image above. Directly below it is Delta Cas. Then Gamma Cas is to the "southeast" (as if the top of the image was north), with Alpha, Eta, and Zeta hanging out in the group below Gamma. I believe Alpha is the center of the group with Eta at the top, though it's a little vexing on the screen compared to this image. Point being, if Archer referred to the fourth star down in Cassiopeia, he could've easily said so. Referring to that as a star just to the left of Polaris is nonsense, akin to referring to the letter just to the left of the last period in the paragraph above as the X in "vexing", not to mention the fact of a difference along the up-down axis. II. The star should not be too far from Earth . . . 130 light-years maximum, probably less. The star is a mere 19.4 light-years distant, putting it within the sort of range needed for the Terra Nova star . . . indeed, the Star Charts author has it listed as such. However, this has some bad effects in regards to the Enterprise season 1 chronology. For instance, it implies that the Enterprise was monkeying about within 20 light years of home for some time, and that the Klingons (and the "Fight or Flight" aliens) were operating within that range normally as well. This would make little sense, since Earth ships were routinely out that far previously. Not only was Terra Nova, colonized in the 2070's, twenty light-years distant (albeit requiring a nine year flight), there is reference throughout the series of the long-established Vega colony some 25 light years away . . . so long established that Mayweather was born on a cargo ship going between Vega Colony and Draylax. That requires the colony's existence by 2125 or so, at least . . . implying an even earlier launch. That's no problem, however, given such things as the launching in 2123 of the "Up the Long Ladder"[TNG2] colony ship Mariposa headed for the Ficus sector, sufficiently remote that no one encountered the two colonies for three centuries, or the launch three years earlier of Earth survey ships HMS Lord Nelson and SS Seattle are launched. (Recall that Earth was not yet united . . . the European Hegemony had independent spacecraft operations as of 2123 and possibly as late as 2190). All that is to say that 20 light-years just isn't far enough. To have the SNW star be that close . . . with Klingons, Xyrillians, "Fight or Flight" badguys, and the Axanar nearby . . . just doesn't work. It would be the equivalent of a modern US Navy ship suddenly discovering the militaries of three separate seafaring nations (two or three of the nations being previously unknown to the US at all) operating within US territorial waters. So I would say that Eta Cas doesn't quite work for distance purposes. The metallicity as determined via the use of iron is about two-thirds of what we have, which is significantly less than what we have for Alrai. The habitable zone centers at around 1.13 times the Earth-sun distance. However, like Alrai, Eta Cassiopeia is a binary system . . . a large star very much like our sun (albeit a bit hotter) has an eccentric companion orbiting it, getting almost as close in as Neptune. This smaller star is between half and three quarters (give or take) of the mass of the main star, though it is significantly dimmer. Our moon, for instance, has a gravitational pull around 200 times weaker than that of the sun. A second sun at Neptunian distance (30+ times greater than the sun's distance) would have a gravitational pull about 1500-2000 times weaker than the sun, meaning it would scarcely be noticed gravitationally. Even luminosity need not be the culprit, given that even if it was half as bright as the main star it would still be 30 times further away. This might make it brighter than the moon, but still largely insignificant. The real kicker would be how to understand the planetary system considering the great sweeping of the Oort cloud and other objects past a Neptune-size orbit by the second star. Whereas Jupiter's had a unique way of protecting the inner planets, the second star of the Eta Cas system would, if dropped in the same orbit in our system, be tossing comets about like chew-toy fragments. But the fact remains that Eta Cas is really more likely to harbor a life-giving planet than Alrai. Eta Cas is even one of the "Top 10" stars hoped to be targeted by NASA's Terrestrial Planet Finder in the hopes of discovering nearby Earth-like worlds, should the TPF project ever materialize. So far as I have found, Alrai is not on that list. While initially I was exclusively of the Alrai opinion, the Eta Cassiopeiae concept is not without merit, at least insofar as being a better system for life. However, while I grant that opinions can differ, the fact remains that Alrai is the better candidate insofar as Trek is concerned, provided a planet could be found to exist there (which one could, at least). The distance and direction from Polaris clinch it, even if Alrai has some real-life issues that could preclude terrestrial planet formation. But in the end, we must acknowledge that this is Trek, and not every referenced Trek planet could possibly have a real-world counterpart. Thus "Strange New World", third episode of Enterprise, occurs in the binary star system called Alrai, some 45 light-years from Earth. This planet is colonized by humans in the early 23rd Century, and is named Archer IV (presumably with the star renamed Archer). Interestingly enough, "Strange New World" features Crewman Cutler, played by the late Kellie Waymire, pointing up at a star and identifying it as Earth. Besides the "Home" moment being a lovely (if even unintentional) homage to that scene, it should also be possible to see what the stars look like in our direction from Alrai and compare. (I'd be surprised if they matched, but it would be interesting to check nonetheless.) However, I am not able to see more than a couple of stars in the sky view in "Strange New World" at this time.